Build and stack for limitless fun with the award-winning First Builders Big Building Bag. These bright pink-coloured blocks encourage hands-on exploration and open-ended play. Construct tall towers and fantastic fortresses. First Builders blocks are made big, especially for little hands to handle. When playtime is over, conveniently pack and store the blocks in our new eco-friendly, PVC- free packaging. Compatible with all Mega Blocks First Buliders toys. 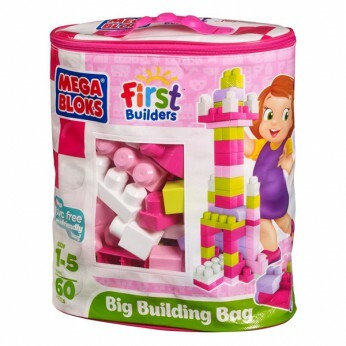 This First Builders Big Building Bag by Mega Brands will delight your child with its 60 dazzling pink and purple blocks. Accented with bright yellow and lavender, these big blocks are perfect for creating colourful creations. When playtime is over, conveniently pack and store the block in our eco-friendly, PVC-free packaging. The bag includes 60 big building blocks! Play, store and take it with you wherever you go! Sturdy, practical and reusable storage bag. It is the perfect toy for your little building fan who is just learning how to build with their own two hands. Give children the opportunity to stimulate their imagination and learning skills while encouraging discovery, fine motor skills and open-ended play. The practical storage bag keeps all of the pieces securely in one place and comes with a hand-strap to make carrying the blocks a snap! One supplied; Size H34, W29, D10cm; For ages 12 months and over; Manufacturer’s lifetime guarantee; EAN: 065541084179. WARNING(S): Only for domestic use. This toy costs approximately £9.99 (for the latest and best prices make sure you check our retailer list for the Mega Bloks First Builders Big Building Bags Pink above). In our review of Mega Bloks First Builders Big Building Bags Pink we classed it as being suitable for ages 1 to 3 years but recommend you check the manufacturer specific advice before purchasing.